... 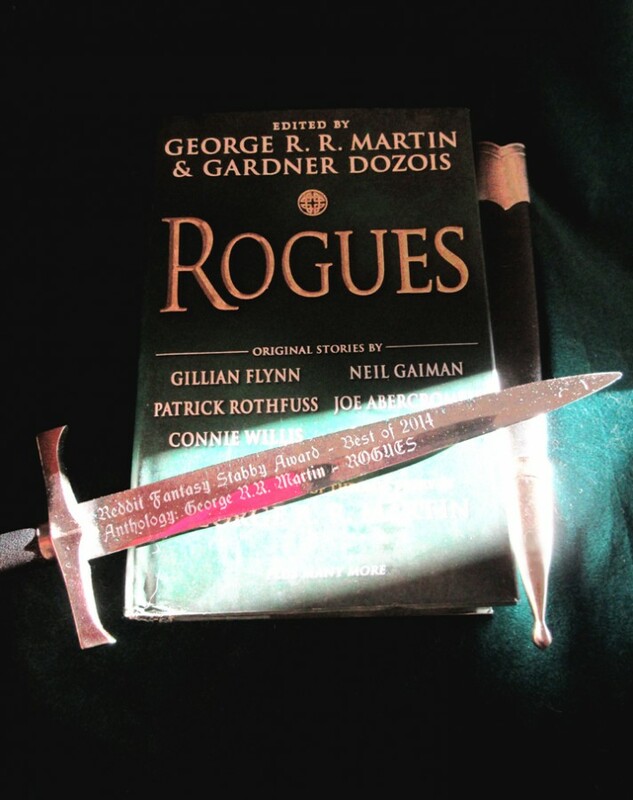 I have been promising my fans on Reddit to post a picture of the Stabby Award they so kindly bestowed on ROGUES, but somehow it kept slipping my mind. But I finally got a half-decent pic, courtesy of my minion Raya. The Stabby really is a striking award. And no doubt will prove very useful come the zombie apocolypse. That's cool. I hope you have the space to display and honor them. The sword award seems unique. That is a very nice award man, congratulations you totally deserve it! From all of us at /r/asoiaf and /r/gameofthrones, have an awesome day! Oh and from /r/dreadfort too. Such a unique award! Never know when it might come in handy one day. 20 bucks says it's Lightbringer. Its looking nice and different-one for an award.Looking like 'Dark Sister'. is that High Carbon Steel? I too always think about how useful my swords (2 of them Game of Thrones swords and my 1 Book Needle) will be for the Zombie Apocalypse! "Rogue Prince" was nice, but it really whet my appetite for "Fire and Blood". I really want to know what the dragon genealogies were - so far we've just been guessing. I thought it was a great touch that in the upcoming Season 5 Blu-ray they have a 20 minute motion comic on the Dance of the Dragons, and the Daemon Targaryen sections are narrated by none other than Pedro Pascal! (Oberyn Martell!) -- which is great given that Daemon was basically "the Targaryen Oberyn" and indeed, Oberyn was his direct descendant. Good times!